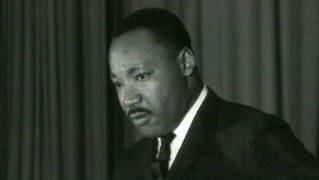 The Lost Dr. Martin Luther King Speech: How the Pacifica Radio Archives Unearthed a Piece of History | Democracy Now! Brian DeShazor, director of the Pacifica Radio Archives, discusses how he discovered this lost speech of Dr. Martin Luther King Jr.
AMY GOODMAN: This is Democracy Now!, democracynow.org, The War and Peace Report. I’m Amy Goodman, as we turn to a story about what appears to be a lost recording of a speech of Dr. Martin Luther King discovered in a vault of the Pacifica Radio Archives. In 1964, while he was on his way to Oslo to accept the Nobel Peace Prize, Martin Luther King stopped in London, where he addressed thousands of people at St. Paul’s Cathedral. The date: December 6, 1964. The next day, Dr. King gave a lesser-publicized address at a public meeting in City Temple Hall. The speech was broadcast by closed-circuit TV to crowds in St. Paul’s and St. Andrew’s cathedrals. It was recorded by Saul Bernstein, who was working as the European correspondent for Pacifica Radio. Well, Brian DeShazor, director of the Pacifica Radio Archives, recently discovered the tape of the speech while he was combing through some old boxes in the archives. Brian DeShazor joins us now by Democracy Now! video stream from the Pacifica Radio Archives, in front of the thousands of tapes that he archives, to tell us the story. Brian, well, tell us, how did you discover this tape? BRIAN DESHAZOR: Hi, Amy Goodman. Thank you for having me. Well, I was working on a project called “American Women Making History and Culture: 1963-1982,” which is a grant project funded by the National Archives, the National Historical Publications and Records Commission in Washington, D.C., to preserve over 2,000 women’s recordings. Well, I was behind—and behind me, you can see a bunch of boxes and bunches of shelves. And that area is where there’s uncatalogued materials, things that we’ve never listed or inventoried or given a number. So it’s stuff that was just sort of put into a box from, say, New York station WBAI and shipped to the archives, and it’s been sitting there for 40, 50 years. Well, we sort of set it aside, and our senior producer, Mark Torres, in the archives, just a month ago—or, no, maybe actually two weeks ago, finally put it on our Studer machine and transferred it. It was in quarter-inch track. It was a small, seven-inch reel-to-reel. And we thought it might be a half an hour or less. Well, it—he sounded like a chipmunk, so we had to do some digital editing and filtering to get it to sound perfect, and it’s an hour-long speech. And more than that introduction is that it was recorded by Pacifica Radio’s Saul Bernstein, as you had introduced, and that what we had was a recording that we cannot find another copy of. There’s a two-minute-and-45-second video that’s available from a London source, but it is—that’s the only thing, just two minutes, 45 seconds. And it’s unavailable unless you pay a licensing fee. So, what we seem to have is the only known copy of that speech from December 7. AMY GOODMAN: And, in fact, it wasn’t a tape from 1965, as the box said, is that right, Brian? BRIAN DESHAZOR: Right, right. And as archivists know, there’s a lot of information that is incorrect when you locate something, so you actually have to put the reel-to-reel on a machine, listen to it and then do the research from scratch. So, '65 was probably when it was broadcast on Pacifica, if at all, or if it was planned to be broadcast. But again, we have no record of it actually getting broadcast. And because the tapes made him sound like a chipmunk, I don't—we can’t figure out technically how they got it to sound right on a machine without making another copy somehow. And back then, there was no digital recorders. AMY GOODMAN: So, describe the scene at the time. I mean, this is 1964. Dr. King is about to be awarded the Nobel Peace Prize on International Human Rights Day on December 10th in Oslo, Norway. So, have you researched what this trip was in London? BRIAN DESHAZOR: Yes. You know, in London, it was basically a stopover on the way to Oslo. And he had been to London before in a previous year, so he was invited officially to speak at St. Paul’s Cathedral. But this December 7th event was sponsored by the Christian Action of London, and they’re an organization, much like the Southern Christian Leadership Conference or the NAACP, an extension of the the civil rights movement, basically, into Britain for black British citizens. And they’re still in existence today. So it was considered a public meeting. This was when the people—he could address the people of London. And he talked about the history of slavery. He talked about the American civil rights movement as it applied to British people. And what was interesting for me is that, you know, when King talks to Americans about slavery and the history of African Americans, it takes on a certain context that we understand from American history when we grow up. But when you go to Britain, you have to step back a pace and start over from a different point of view, because they have a different point of reference. So it’s extremely interesting when he talks extemporaneously of how he really sort of restructures his speeches that sometimes we are familiar with. AMY GOODMAN: Talk about the significance of what it means to have a recording like this, which is very much what the Pacifica Radio Archive is all about. BRIAN DESHAZOR: Right. Thank you, Amy. Yeah, the Pacifica Archives, we do hold 50,000 tapes, like those behind me. And Pacifica Radio is the oldest and largest collection of public radio programming in the United States. The first bastion of public media was listener-sponsored, noncommercial radio, Pacifica Radio in Berkeley, California, founded by Lewis Hill, a conscientious objector and a Quaker, and understood the need for media to be not corporate-overrun. So this is basically that record. So, before NPR and PBS and the public system, Public Broadcasting System, of the early 1970s, Pacifica really was the only game in town in terms of media and free speech, and welcoming fringe dwellers and outsiders and activists and political pushers, and Dr. King, Malcolm X, Rosa Parks, all those people. And the entire civil rights movement was covered on the ground from the very beginning by Pacifica Radio. It started in 1949, and we have evidence of 1949, six months into broadcasting, they had a roundtable with African-American students at UC Berkeley on a panel about racism and discrimination. They started the game of the dialogue, the public dialogue, of civil rights and relations and race relations in America. And this is the record. These reel-to-reel tapes are the evidence of that broadcast. And there’s no other evidence in the world of these tapes, so that when I spoke about Rosa Parks, for instance, we have the recording of the very first interview with Rosa Parks after she got out of jail from that first arrest in 1956. Malcolm X speeches, James Baldwin speeches—not only the big speeches of public—publicity, or in the public, but James Baldwin in intimate interviews and in intimate conversation, and again, traveling with Dr. King. We do have a recording of James Baldwin and Dr. King together here in Los Angeles speaking to men and women in the arts concerned with Vietnam. So, this recording, this archive is an American treasure, and every citizen in America, I hope, understands that this collection, we want to be able to make it accessible to you, the public. We want it to be in the classrooms. We want it to be in high schools. We want universities to have this for their scholarly research and their scholarly endeavors. And that will make history change. It will be able to have us, the political left, if you will, the progressive left, the record of the activism available for history in the future. And if we don’t preserve this deteriorating, fragile tape, then that history will be lost, and we’ll lose the connection with our elders, like Dr. King. This very speech, this may have the quote that inspires somebody to take the next step in our fight for racial equality and justice in America. AMY GOODMAN: Well, Brian, I want to thank you for being with us, director of the Pacifica Radio Archives in Los Angeles. Thanks so much.